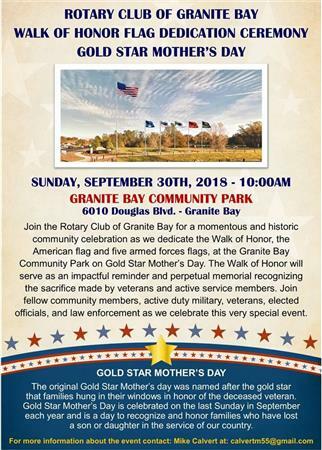 Join the Rotary Club of Granite Bay for a momentous and historic community celebration as we dedicate the Walk of Honor, the American flag and five armed forces flags, at the Granite Bay Community Park on Gold Star Mother's Day. The Walk of Honor will serve as an impactful reminder and perpetual memorial recognizing the sacrifice made by veterans and active service members. Join fellow community members, active duty military, veterans, elected officials, and law enforcement as we celebrate this very special event. The original Gold Star Mother's day was named after the gold star that families hung in their windows in honor of the deceased veteran. Gold Star Mother's Day is celebrated on the last Sunday in September each year and is a day to recognize and honor families who have lost a son or daughter in the service of our country.